I know what you’re thinking: “Wait, that doesn’t look bad at all!” Trust me, I thought the same thing. In a similar fashion to how my Nissan 300ZX Twin Turbo drew me in with its dashing good looks and a promise of speed, this 1989 BMW 325i appeared to be the lithe and practical all-purpose runabout I’d been searching for. I bought it for $1800 with a smile on my face and a gleaming vision of the fun little fixes which lay ahead. It wasn’t until I found myself as the new owner of a certain black German sedan that the severity of the project at hand truly hit home. In fact, the price alone for a decent manual 325i sedan should tell you a lot—it’s not uncommon for some of these to go for $10 grand or more. The innocent-looking car in question hails from an era when BMW build quality was something an owner could be proud of. It was a time when the important mechanical bits were made of metal, and components like the water pump were as reliable as the belt that turned it. The electronics within, while advanced for their time, are straightforward by today’s standards. 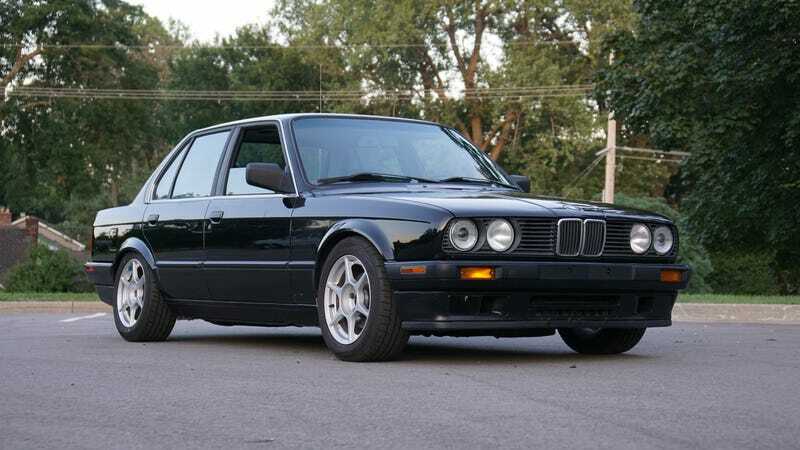 The E30 3 Series stood as a sophisticated—yet fundamentally simple—performance machine. Perhaps it was this nostalgic view which drew me closer to this one-owner autobahn cruiser. Its inline-six engine started up at the turn of the key and settled into a smooth idle. There were bumps, there were bruises; door handles were broken and the gauges (including the odometer which was stuck at 234,000 miles) didn’t work. It looks alright until you peek under the seat covers. However, all of this could be explained; when there’s only been one owner, you get the car’s whole story. The seller spoke about when the car brought his newborn son home from the hospital. He explained how it moved the whole family from California to Kansas when a career change happened in 1995. He mentioned the crashes, he talked about the breakdowns. There were nearly 30 years of life played out around this vehicle. I might be alone in this, but when the bad stories mix with the good, I suddenly feel comfortable around an otherwise imperfect car. Many would mark the car up to junk, but others would say it’s full of character. To me, this car was wholesome project material. I hopped into the low-slung Bimmer and reacquainted myself with ergonomics that spawned from an earlier time. There were no blind spots nor an exploding steering wheel to hide behind should things go south. The car’s safety revolves around the driver being alert, a somewhat sobering reality when mixing with today’s screen-scrolling traffic. The experience one has behind the wheel of a classically-styled BMW is all consuming, and the E30 stays true to that motif. After your eyes have feasted upon the simplicity of the elegantly recessed quad-beamed front end and the tall, open greenhouse, the pleasure of driving grasps your senses. It doesn’t matter if you are meandering through the ’burbs or driving spiritedly along the back roads. These cars are alive, plain and simple. They’re light, agile, and reasonably quick. Even this old and tired 325i still managed to capture the classic BMW magic. After a not-so-brief test drive, I felt at ease with the prospect of bringing this car home with me. The transmission shifted well and the engine pulled with an effortless wave of torque. While there were a tremendous number of items I could see wrong with the car, my mental calculator didn’t have them adding up to much. Then the next morning happened. Leaks. Good Lord there are leaks. Fluids of all kinds were pooling en masse underneath the unassuming 3 Series. I began creating a list of all the issues that just a day prior seemed like minuscule, easy-to-remedy problems, everything from electrical gremlins, shabby interior parts, paintwork blemishes, and mechanical ailments suddenly began weighing heavily on my conscience. The number of issues grew to over 50 when the realization hit: This was not going to be a quick nor cheap turnaround. Stepping back and looking at the car, I saw there wasn’t a single part of this thing that didn’t need attention. I bought it because it ran well and it had that timeless BMW look. But that’s where the redeeming qualities ended. This poor car had stopped receiving loving care from its one-and-only owner many years ago. What was I thinking! I started mopping the floor and leveled with myself. I screwed up; I took a gamble on a project and lost. But who am I kidding—if I wasn’t looking for a challenging project, then why was I looking for one at all? This car deserves a second chance, and dammit, I plan to give it just that. I’m determined to make this car the enviable performance sedan it once was all those years ago. So get ready, this is sure to be a financially questionable endeavor—one which hopefully ends on a positive note.